Weekly Standard: A Pastime Past Its Prime Baseball was once the definitive sport of the United States but has the game finally struck out? Joseph Epstein of The Weekly Standard shares thoughts and memories of the old ball came and reflects on author Lee Congdon's reminiscent book about the sport. 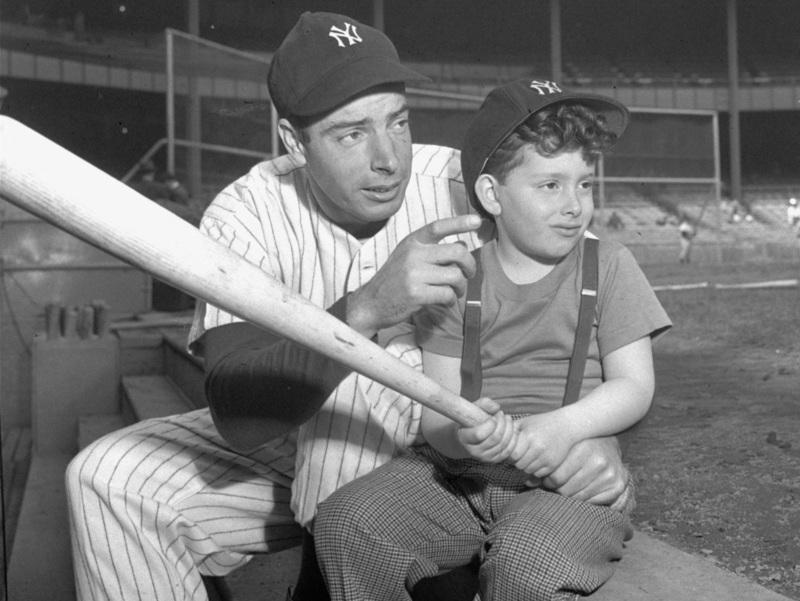 Joe DiMaggio of the Yankees passes on a few batting tips to his 5 1/2-year-old son, Joseph III, prior to the Yankees — Washington Senators game at Yankee Stadium, New York, April 27, 1947. Joseph Epstein, a contributing editor to The Weekly Standard, is the author of the forthcoming Gossip, The Untrivial Pursuit. When Marilyn Monroe divorced Joe DiMaggio, Oscar Levant remarked that it only went to show that no man can be expected to excel at two national pastimes. Time can do terrible things, even to wit, and this superior mot now has a slight flaw, which is that it is no longer clear that baseball is America's other pastime. In the 1940s and early '50s, the national pastime it indubitably was, a game that captured the country's attention and enraptured the imagination of young boys and most men, who had earlier played it as boys. Just how it did and why it did and with what consequences is the subject of the intellectual historian Lee Congdon's Baseball and Memory, a book about the game but also about much more. The 1940s and '50s, the years at the center of Congdon's book, are those of his boyhood, and, as it happens, also of mine. The sports menu during those years was much shorter than it is now. Professional basketball hadn't yet arrived in a serious way; professional football had a short season, and not many teams had franchises west of the Mississippi; hockey was still felt to be essentially a Canadian sport; golf and tennis were thought, for the most part correctly, to be country-club or rich people's games. Baseball was the main, the primo, the supreme American sport. If baseball had a serious rival as a spectator sport, it was boxing, for a heavyweight title fight riveted American attention like no other sporting event. But such fights were intermittent, and baseball was played daily for six months, eight if one includes spring training. Besides, one had to be a brute to box, while baseball was a game available to every boy of normal size and decent coordination. A Little League World Series was staged as early as 1947, but baseball for young boys remained largely unorganized through Lee Congdon's and my boyhoods, a playground game unimpeded by otiose intervention from adults. Summer days one ambled over to the schoolyard, and got into a pickup game with other kids who had the same end in mind. If there weren't 18 boys up for a game, the positions of right field, second base, and first base were eliminated, and one played something called pitcher's hands out. As a boy, one styled one's play on one or another of the major league ballplayers one had heard about on the radio, or read about in the sports pages or in Sport magazine, or had seen at the local ballpark, if one lived in a city with a major league team. I played shortstop on the gravel field of Daniel Boone School with a trapper's mitt bought from Montgomery Ward, doing my best impression of the St. Louis Cardinals' great shortstop Marty Marion. The ranks of boyhood baseball players thinned out in high school, where baseball wasn't one of the glory sports. Large crowds didn't attend high school baseball games the way they did football and basketball games; and there weren't any girls watching from the stands before whom — hope against hope — one might look heroic. I left playing baseball in high school for a perfectly mediocre career in tennis and basketball. High school baseball was a game for the true hard cases: boys who loved the game in and for itself. In those days high school baseball could be a dangerous sport. Batting helmets were not yet devised, and 16- and 17-year-old opposing pitchers threw heat, as fastballs were even then called, with uncertain control, leaving open the real possibility of being smashed in the head or face. Getting spiked while tagging a runner out was another hazard. Then there were line drives — "screaming liners," "frozen ropes," in the standard clichés — smashed back at the pitcher or third or first baseman. However pastoral some writers make baseball seem, the possibility of serious injury was part of the game. Even if one stopped playing it once out of grammar school, baseball remained in the bones of most American males. Boys grew up knowing the rosters of the then-16 major league teams, traded baseball cards — now, some of them, worth obscene sums of money — passionately argued the merits of various players. I probably learned more arithmetic attempting to understand batting averages and other key statistical categories in baseball than I did in the classroom. Sidney Hook once told me that, during his days as a high school teacher in Brooklyn, he used the location of major league baseball teams to teach otherwise bored and unruly boys geography. The last two words of the National Anthem, an old joke had it, were "play ball." Baseball was American, a part of the culture. During World War II a way of identifying oneself to fellow American troops when returning from behind enemy lines was through one's baseball knowledge. "Staff Sergeant, Bob Mahoney, Fifth Armored Division, Headquarters Company." Not knowing who Ted Williams was might have got one shot. Sports generally, but baseball most of all, was the lingua franca of American men in a democratic country. Baseball could nicely slice through social class and educational lines. Through their common interest in baseball, a philologist could sustain a good conversation with a garage mechanic, a butcher with a biochemist. Baseball and Memory begins with Bobby Thomson's home run in the old Polo Grounds, hyperbolically known in the press as "the shot heard 'round the world," in the final playoff game that won the pennant for the New York Giants over the Brooklyn Dodgers on October 3, 1951. For decades afterward men marked the event, as others marked Pearl Harbor or the Kennedy assassination, by remembering where they were when Thomson hit his homer. The home run was hit at 3:58 Eastern Standard Time, Congdon notes, a fact that reminded me that I had just come out of my last class for the day at Nicholas Senn High School in Chicago, headed for the smoke-filled purlieus of Harry's School Store, where it was of course topic number one. Along with Thomson's home run, Congdon recalls Don Larsen's perfect game against the still-in-Brooklyn Dodgers in the World Series of 1956. (I watched the game on a blurry television set while sitting on a couch with the stuffing coming out of it in a broken-down fraternity house at the University of Chicago.) He retells Pittsburgh Pirate Bill Mazeroski's walk-off homer against Ralph Terry to defeat the Yankees in the 1960 World Series. He sifts the evidence about Babe Ruth's supposedly calling and aiming a home run at Wrigley Field in 1932 (accuracy on the question has yet to be solidly established). Lee Congdon has spent — I hesitate to say wasted — his youth and much of his manhood as a Chicago Cubs fan. (So, too, did I, until a few years ago, when I proclaimed myself the baseball equivalent of a bisexual and began also rooting for the White Sox which is, to put it very gently, not de rigueur in Chicago, where ardent fans of either team loathe fans of the other.) As is well known, the Cubs have had an uncanny knack for letting their fans down — hard. The team has not appeared in a World Series since 1945 and not won a World Series since 1908. But then, any team, as a sad local quip has it, can have a bad century. The pages of Baseball and Memory are replete with Cubs pitchers with high earned-run averages and poor career won-lost records, sluggers who could be counted upon not to come through in the clutch, egregious trades of brilliant ballplayers — Lou Brock, Rafael Palmeiro, most notable among them — for now properly forgotten ones. In 1969, with, for once, a solid roster of players (five of them on that year's National League All-Star team), the Cubs, though 9 1/2 games ahead of the Mets in August, went 8-17 in September and blew what looked like a sure trip to the World Series, proving that even when they were good they weren't good enough. The Cubs got to the playoffs in 1984 and looked to be going on to the World Series when, in the late innings of the deciding playoff game against the San Diego Padres, the team's first baseman, a man named Leon Durham, let a fairly easy grounder go through his legs. The next day, at my neighborhood grocery market, the manager asked me if I had heard about Durham's attempted suicide: "He deliberately stepped out in front of a speeding bus," he reported, "but it went through his legs." "Long-suffering" is as natural an adjective for Cubs fans as "wily" was for the late Ho Chi Minh. I have a cousin named Stuart Rudy who, as a young man, had incipient ulcers and was implored by his physician not to subject himself to the anguish of listening to Cubs games on the radio. A man named Jerry Pritikin, now in his seventies, sits in cut-off jeans in the bleachers during games at Wrigley Field, sometimes bringing along encouraging handmade signs, behaving generally in a way that reminds one that the word "fan" derives from fanatic. I once heard him, in an interview, remark that next to his father, his own zeal is as naught: "My father's deathbed words," he said, "were 'trade Kingman.' "
Congdon shows no signs of regret for his long years as a Cubs fan, however little punctuated by glory or triumph they have been. He does, though, have deep regrets about what has happened to the game of baseball that he was brought up on and still loves. Sports have politics: Fans line up along a liberal to conservative spectrum, and not infrequently people who are liberal in their politics are archconservative in their views on sports, and vice versa. On this sports spectrum, Lee Congdon is a veritable wingnut. He feels that baseball has been diluted by the increase in the number of teams from 16 in his youth to 30 today, with a corresponding thinning-out of talent. He prefers the older vintage ballplayer, whose natural talent was reinforced by toughness and dedication and, often, amusing eccentricity. He quotes the Brooklyn Dodgers pitcher Preacher Roe saying that the best advice about pitching to the Cardinals great Stan Musial was "throw four wide ones and try to pick him off first base." He cites the competitiveness of the take-no-prisoners pitcher Early Wynn who, when asked if he would deliberately throw a ball at his own mother, replied: "I would if she were crowding the plate." A purist in his baseball values, Congdon does not like extending playoffs to wild card teams, has no taste for interleague play, despises the designated hitter instituted by the American League in 1973 — "an obscenity," he calls it — and not yet adopted by the National League. The newer baseball stadiums put him off; only Wrigley Field in Chicago and Fenway Park in Boston pass his muster. He doesn't approve the rule against pitchers deliberately brushing back hitters crowding the plate. He is opposed to better — perhaps the more precise word is fancier — food being served in some ballparks; he mentions the truffle fries and martinis served at the Mohegan Sun Sports Bar at the new Yankee Stadium. These are extreme views, highly unprogressive, and doubtless deserve to be argued against — though not by me, who happens to share every one of them. About the use of steroids among baseball players, Congdon is an even harder-liner. He believes that no player found to have used steroids should be allowed in the Hall of Fame, and that all of them ought to have their records wiped off the books, tout court — into the dustbin of history with all these audodidact pharmacists. To illustrate how widespread the use of steroids was, he brings up the almost commonplaceness of ballplayers in the steroid era hitting 50 or more home runs in a season — a feat never accomplished by such chemical-free ballplayers as Hank Aaron, Frank Robinson, Reggie Jackson, Mike Schmidt, Ted Williams, Ernie Banks, and Eddie Matthews. His paragraphs on steroids are infused with anger. Congdon recapitulates the year, 1998, of the great (ultimately fake) home run derby between Mark McGwire and Sammy Sosa. For a portion of that summer I was housesitting for a friend in the village of Laconnex, near Geneva, and each morning upon arising I eagerly booted up his computer to see if McGwire or Sosa had hit any homers the day before. Both players, we now know, were jacked up on steroids. Turns out that I, along with millions of others, as the old Brooklyn Dodger fans used to say, was robbed, or at least had, and it's not a good feeling. Growing up, as (again) did I, on the splendid boys' sports novels of John R. Tunis — The Kid From Tomkinsville, Highpockets, The Kid Comes Back, Rookie of the Year, All-American, Iron Duke, and others — Lee Congdon brings a moral mindset to his love of baseball. While telling gripping sports yarns, Tunis's novels inculcated the tenets of the old liberalism at its finest: teamwork, courage under pressure, fair play, hatred of prejudice. All but the last-named virtue has little today to do with sports; in fact, athletes and their coaches and managers spend a good deal of time seeking out the niggling small advantage that will defeat or otherwise discourage the opponent. Sportsmanship has less and less to do with contemporary sport. One of the results is that ballplayers have come to reflect, as Congdon contends, "our baser rather than our nobler selves." With a few notable exceptions in the contemporary era — Cal Ripken Jr., Rick Sutcliffe, Orel Hershiser, Andre Dawson, Carlton Fisk, possibly Derek Jeter — athletes tend to be disappointing human beings. Perhaps this comes of their being men who, even as boys, owing to their much-prized physical talent, nobody ever turned down for anything. In the current era, where money from enormous television revenues and posh endorsement contracts arrive for them in wheelbarrowish quantities, the emergence of character in an athlete is even more difficult than when all he had to deal with was adulation. For those of us frivolous enough to have put in a vast number of hours watching men and women chase or smash balls of various sizes, furiously crash their bodies against one another, and commit other remarkable physical acts, the notion of being a fan has become a more and more dubious proposition. The proposition, baldly put, is this: Why are we more loyal to, and ardent on behalf of, teams than are the men who play for them? This is one of a series of questions that all, alas, have the same answer. Why do athletes use steroids? Why do they seem more prone to injury — or is it that they are more protective of themselves? — than athletes of an earlier era? Why are they largely devoid of loyalty? Why has an afternoon at a major league baseball game for a family of four become a $200 or $300 extravagance? A sports journalist once stopped the television sports producer Don Ohlmeyer because he had a question for him. "If your question is about sports," Ohlmeyer replied, "the answer is money." As a historian, Lee Congdon could not have been expected to resist making parallels between the game of baseball of his boyhood and the game today. Nor was he likely to have avoided going on from there to measure the decades when the game of baseball seemed golden against those rather more tarnished — by drugs, staggering contracts, feckless behavior, ugly, electronic-scoreboard-distracting ballparks — decades of recent times. Not merely baseball but life generally was better in the 1950s, Congdon maintains, and he makes his argument in a balanced way, taking on the worst cases. Even though racial segregation was still prevalent in the '50s, for example, he notes that black life may have been qualitatively better, with lower crime and unwed birth rates. "With far more reason to be bitter," he adds, there was less in the way of self-defeating grievance-collecting among blacks then than now. In the 1950s, families, black and white, seemed stronger, life safer, growing up less wracked by the foolish notions of psychology and sociology for too long now in vogue. Whatever its gains in personal freedom, the 1960s, Congdon writes, "has left mountains of human wreckage in its wake." Congdon's larger argument is that baseball, when it was part of the culture, provided an important storehouse of memories, which, under current cultural conditions, soon figure to disappear. These memories, he holds, are all the more important as a stay against the thought that life is pure progress, ever onward and upward. "Fascination with the older game," he writes, "cannot be divorced from a growing recognition on the part of at least some Americans that history does not move in an ever-ascending direction." The young, we are told, are bored with baseball, finding more immediate — baseball fans would argue, also much less subtle — excitement in basketball and football, and even in so-called extreme sports. The number of American black athletes, who until recently comprised a third of major league players, has diminished, while the number of Central and Latin American and Asian players has risen. The day may not be far away when major league baseball is no longer a game played preponderantly by Americans. The United States could once claim to be a national culture, with the majority of its population knowing and singing the same songs, viewing the same television shows, playing and watching and passionate about the same games. This national culture has been eroding over the past half-century, splintering off into many cultures: youth culture, black culture, Hispanic culture, and more. The result is that one can no longer confidently say that a game, an art, a phenomenon, is essentially American. What can confidently be said is that a major trade has taken place over the decades since the 1950s: that of stability for widened tolerance, of moral equanimity for less restricting moral relativism, of a unified culture for a polycultured society. Perhaps, in this trade, there are players to be named later of whom we haven't yet been informed. If there are not, if this is all there is to the deal, then it has to be judged a trade that not even Lee Congdon's boneheaded Chicago Cubs front office would have made.